Savannah, Georgia is home to the famous bench scene in Forrest Gump where Tom Hanks’ character talks about life being “like a box of chocolates”. There are tons of little fun facts like that about our great little town. Did you know Savannah inspired parts of Treasure Island as well? 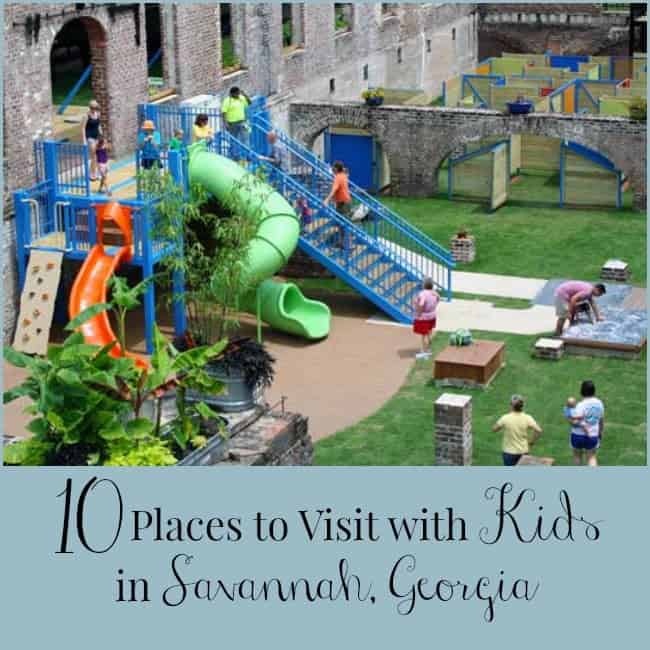 If you are looking to have some fun and maybe unravel a few national mysteries on your vacation to Savannah, Georiga – here are our favorite 10 Places to Visit with Kids in Savannah! Heading south in the fall? You might also want to check out the 10 Most Haunted Spots in Savannah. And no matter when you are coming for a visit, keep these 10 Places to Eat Healthy in Savannah in mind! If you are looking for places to have a ton of fun with your kids while you visit Savannah, Georgia, we’ve got you covered. We live here and our kids are 4,6, and 17 years old. We have kicked ove all the rocks in our beautiful city looking for all the ways to have fun with our kids. 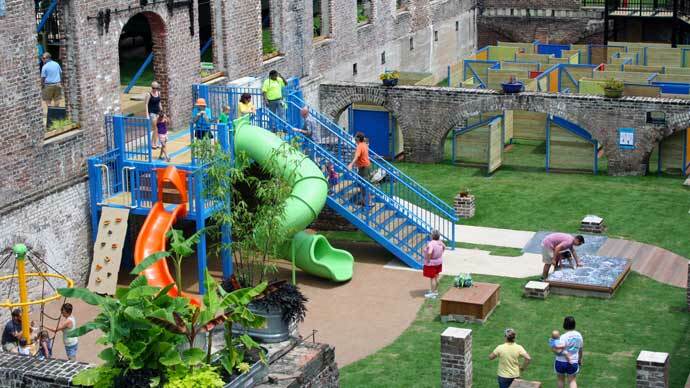 These are 10 of our favorite places to visit with kids in Savannah! Kids and grown-ups alike love exploring Savannah Children’s Museum. Located in the old Central of Georgia Railway Carpentry Shop, the museum features several exhibits that will stretch the limits of your child’s imagination. Find your way through a maze, and explore the sensory garden. Check their calendar before heading over, so you can catch awesome activities like Fairy Week. Scroll down on the calendar page to download and print some free activity sheets for your kiddos. Another great attraction for families is the Georgia State Railroad Museum. Featuring a fully operational turntable, take the day to explore some historic railcars, and even go on guided tours. History is awesome, but it can be boring if it’s not taught right. That is why it’s so important to take fun learning trips to places like the Savannah History Museum. This museum is located in Tricentennial Park, and is a super interactive historical learning experience. Take a tour through Savannah’s history, spanning from 1733 all the way to today. On the same note as the History Museum, one of my favorite educational and historical spots is Battlefield Memorial Park. Read about the history of this park before taking a visit. You’ll learn that more than 8,000 troops fought in the American Revolution Battle of Savannah, the second bloodiest battle of the American Revolution. This memorial park is located across from the History Museum. 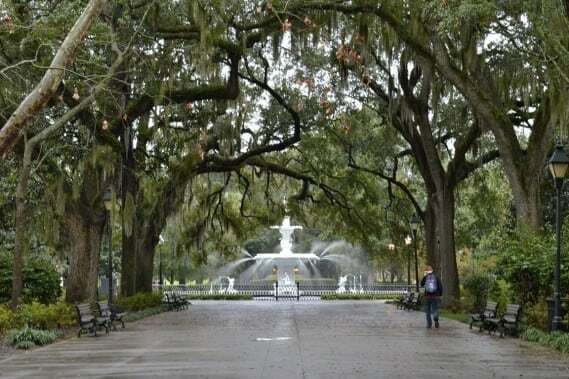 Our family loves Forsyth Park! This huge park has tons of space to play, and you can always watch a pickup soccer or rugby game. Fly a kite, have a picnic, or play battle ball. You could easily spend the entire day here and never get bored. This is also one of those spots that is historical and can be educational, too. Shhh, don’t tell the kids! Not on purpose, I added another educational stop to our list! The Oatland Island Wildlife Center is an adventure just waiting for you! Enjoy fun activities such as Toddler Tuesdays, Field Trip Programs, and more. They featured birds of prey, wolves, and other predators of our great state. Bring a camera, because you’ll want to save these unforgettable memories. Visiting Fort Pulaski is like taking a trip back in time. During the Civil War, this fort was occupied by the Confederate Army. It’s only about a fifteen-minute drive from downtown Savannah, and even though it was built long ago, you can see parts that have remained in tact. Bring your camera, just in case you spot a bald eagle. Open seven days a week, the National Museum for the Mighty Eighth Air Force is amazing. You’ll see the Combat Gallery, a B-17 Exhibit, and learn about the history of the Eighth Air Force in the Memorial Garden. Yep, another museum made the list! My favorite thing about the Telfair Museum, besides the hands-on art projects, is that one Saturday each month, they have FREE Family Days. Take part in story time, create a DIY masterpiece, and explore the ArtZeum, all at no cost to you on these days from 1:00PM until 4:00PM. Check their website for more information. While the Savannah City Market isn’t specifically catered to kids, ours have a blast every time we visit! They love Vinnie Van GoGo’s pizza, and of course the gigantic Candy Kitchen. The Market is an interesting place to visit, and it’s one of those spots that you could spend all day at and still not see everything. It’s going to be tough to decide which one to visit first. Let me know your favorite(s) in the comments.